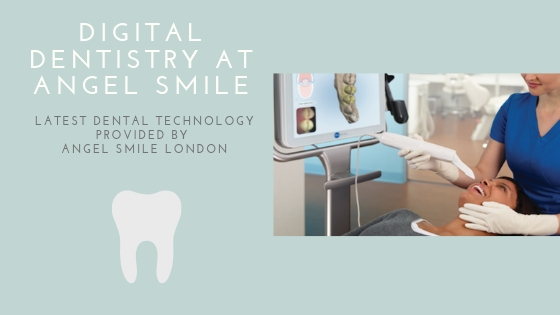 At Angel Smile London we ensure that we’re up to date with the latest technological developments in dentistry and orthodontics. Digital dentistry includes any dental technology or device equipped with digital or computer-based components. We are replacing modern technology with older mechanical or electrical methods for more effective, efficient and painless dental treatments. We consider computer-aided dentistry the way forward in our practice as it removes several manual steps through automation. What are the dental advances of digital dentistry? So called intraoral cameras take immediate pictures of your teeth, which are then processed and sent directly to the lab within minutes. We use these for most of our treatments such as dental implants. Digital radiography leads to higher quality images to be taken and it significantly reduces the exposure to radiation compared to X-rays. At our N1 dental clinic we use this digital innovation for treatments of chipped teeth. Depending on extent of the broken area we can use a composite filling(resin), a veneer (ceramic) or a crown (ceramic) to restore the chipped tooth. New technological tools such as Diagnodent and VELscope have led to earlier detection of dental diseases – cavity and oral cancer identification are more reliable and faster. This leads to the patient benefiting from earlier treatments, improved prognosis and shorter recovery times. 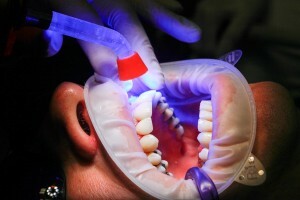 Lasers for surgical procedures are minimally-invasive techniques that ensure more effective, less painful and more accurate dental treatments. At Angel Smile we use laser periodontal therapy as supportive technique in conjunction with classical procedures of gum treatment showing promising results for eligible patients. This allows bleeding, pain and swelling to be limited because periodontal laser therapy is less invasive than regular surgery. Recovery and healing times are significantly shorter. Digital scanners replace conventional impressions. They save time and effort when using them for crowns, bridges, implants and Invisalign cases. At Angel smile we do digital scans of your teeth and create a digital treatment plan for you, using our state of the art technology, showing you what your results could look like via a 3D video. Modern CBCT scan technology together with the intra-oral scan helps our expert in guided surgery, Dr Amenien, to virtually plan and select the appropriate length and diameter of your implants using the latest software solutions. Dental CAD/CAM machines and digital 3D printing advance the manufacturing and milling of metal, resin, porcelain, and zirconia for dental prosthesis creation. CEREC is a sophisticated CAD/CAM (computer aided design/computer aided manufacturing) system for same day restoration of damaged teeth in form of inlays, crowns, bridges and veneers. It allows for priceless precision & natural appearance within the same session for your tooth replacement. We use metal free, highly aesthetic, tooth coloured biocompatible blocks of CERAMIC to create inlays, crowns, bridges and veneers. 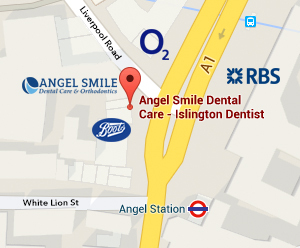 Why choose Angel Smile London for your modern digital dental treatment? We are constantly investing in the most advanced and modern technology systems developed for dentists and orthodontists all over the world. We believe our patients deserve the best. 25 years of clinical studies in digital dentistry portray a clear picture: high biocompatible restorations have even better long-term results than crowns made by technicians at the laboratories. Patients can receive care faster, and often with fewer dental appointments, using these digital dentistry advances. Save money, time and pain with our latest dental technology for your dental treatment today and call us on 02078373938 or send an email to: reception@angelsmile.co.uk to schedule an appointment for a consultation with our digital dentistry expert Dr Amenien.